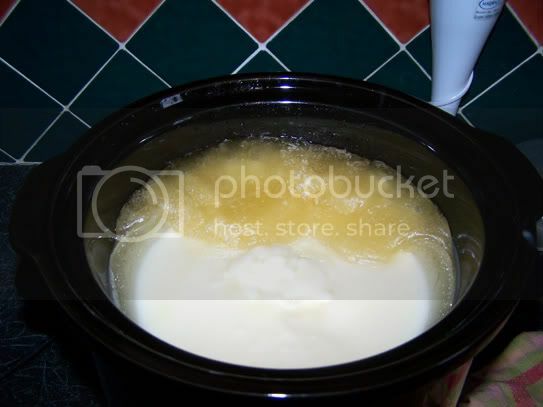 Gracefruit.com - Making Soap, Living Well: Crock Pot Hot Process Soap Tutorial -- Photo Heavy! 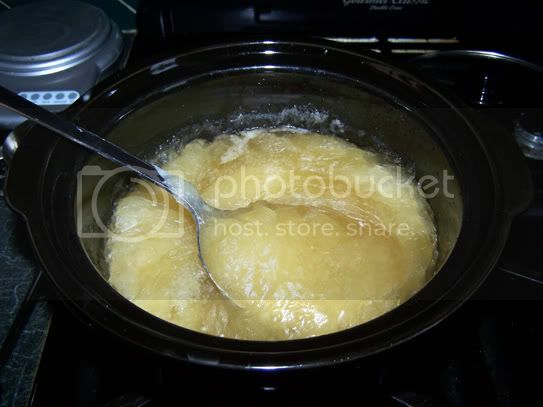 Crock Pot Hot Process Soap Tutorial -- Photo Heavy! Here are a few pictures to show what happens when I make CPHP. Your results may vary, though! Please note that this tutorial is designed for those already familiar with cold process soap making. Now you can zap test the soap by taking a little bit out and rubbing it between your fingers to help it cool. It should feel waxy. Once the soap has cooled, lightly tap your tongue with it. If you get a sensation that feels like a 9-V battery, you have active lye in your soap and will need to cook it some more. If not, you can move on to the next step. When the soap has cooled, turn it out and you’re done! Remember that any HP needs to cure for at least one week, preferably two. It’ll get harder and milder in this time. Due to time constraints, I'm no longer able to support questions with regard to the tutorial. Thank you to everyone who has taken time to comment. I hope you'll continue to visit! Superb! You are an angel to those that are strating out (like me) and makes mountains out of mo-hills (this stage makes me procrastinate)after buying everything I need to make soap, melts, bombs, etc. Aw, thanks! That's very kind of you. Thank you so much for sharing this - more than helpful to people such as myself who are newbies at natural soap making. 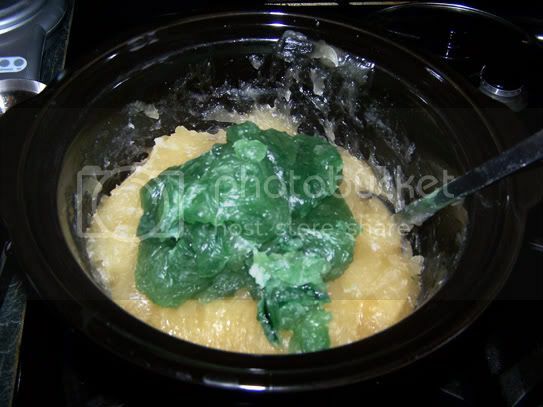 This is the best Crock Pot soap tutorial I've seen. Thanks so much everyone. Sorry I'm late responding! Hannah, I never get the 9-V battery 'shock' anymore. I have learned to eyeball HP pretty well. When I first started out, I got it a few times, but quickly learned to recognise gelled soap. Beth, you did a wonderful job with your tutorial. But isn't the crockpot too tiny?! Haha! That was back in the day of the 2 kilo batch! Elizabeth what a great honest no nonsense tutorial. So many people mystify soapmaking which puts beginners off. 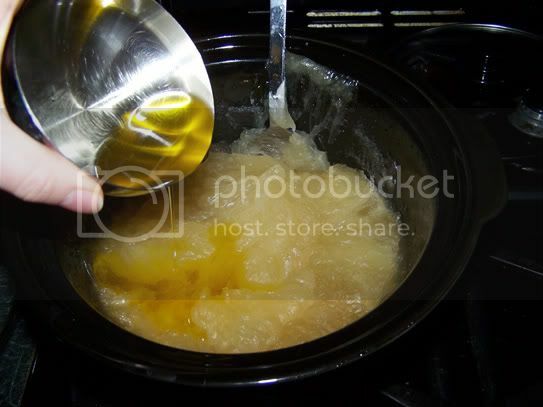 Are you planing more hot process tutorials for those of us that don't have a crock pot? Thank you so much! I used to do oven hot process, but found it heated up my house too much in the summer. When the weather cools off a little, I can definitely look at doing a tutorial for OHP. can you use a stainless steel saucepan or does the pot need to be ceramic? I'd recommend using the pot that comes as standard with the crockpot you're using. Wow - sure makes it look 'do-able'. I've been afraid to tackle HP, but this gives me confidence! I am new to your blog but love your tutorial! 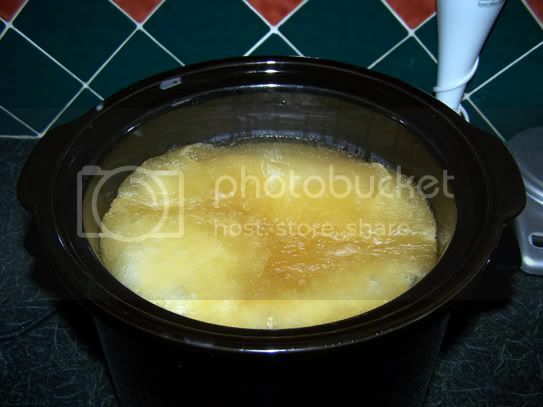 I wanted to ask - I am going to buy a slow cooker to try this is a 3.5 litre one sufficent? Thanks so much! I believe the crockpot I used in the tutorial is a 3.5 litre, so yes! That's a good size pot. I am back again, I love your blog! I am about to atttempt making my first batch of soap, but something has stumped me? I have been reading about the water I should use to make soap - distilled, but I am having so much trouble finding it anywhere on the high street, and it's also quite expensive? Is there another option, or does it have to be distilled water? If you live in an area with hard water, you might consider investing in a water filter. I have used a Brita with great results. I've been making CP soaps, and was put off HP because I was told the high cooking temp would damage some of the oil qualities. I want to use some additives that would probably evaporate with the gel stage in CP, so this is ideal for me. Do you know what temp the soap get to when cooking? And what size crock pot do you now use? I set my crock pot to its lowest setting and the soap barely reaches 140F. To ensure your HP soap gels, you shouldn't need to take it any hotter than that. I use a 6 litre pot now, but when I first started, I think it was a 2.5 litre. can anyone tell me approximately how long it take to cook from start to finish. I don't think I am cooking long enough. When my island disappears I stir and it is like way thick in the center. I don't know how to correct this. Will continuing to cook help. The cooking time depends a lot on your recipe, but you shouldn't have to cook for more than 45 minutes. When you say it's thick in the centre, does this mean that you can't stir it at all? I researched and read anything I could about soapmaking for about 1year before I ever made my first batch. I sure wish I would have found your tutorial first. Everytime I see a hot process soap instruction it says for thoe familiar with cold process, but I have only done hot process in the crock pot and that is because I am too impatient to wait a month for soap to cure. Can you tell me is cold process easier? I have been wanting to try it. Cold process isn't difficult at all, but I think more can go wrong with it. I can't really say that I favour one method over the other. CP is easier if you need to make lots of soap, and HP is better if you don't want the hassle of a possible failed batch. Do give CP a try. Once you do, you'll be making it all the time! This was a really cool tutorial. It's nice to see other people's way of doing HP. My preferred method is to set the crock pot on high. This takes the soap through other stages, that I oddly like to watch. For the person who asked, for me with the crock pot on high takes about 1.5 hours to complete a small 2lb batch. It used to take longer until I mastered several recipes and can eye it pretty good now. I can't remember the other person who asked if you need to cook it in a crock pot only. You don't. You can use a stainless steel pot on the stove if that's simpler for you. Thank you so much for the recipe anyway, I got that 9V sensation on my tongue however I already poured the mix into my mold, is there a way to save it? Hi Anderson. Just leave the soap to cure for a few days. It might be that it didn't cook long enough and will finish saponifying in the mould. Check it in a few days time and see if it still zaps. Thank you for the tutorial. Gotta love giving ppl. Do you have any suggestions where I can get that mold you used in your tutorial? All I find are very expensive wood loaf molds, 2-3 cavity molds or plastic loaf molds where you still have to cut the soap into bars afterwards. Hi Darcy! Where are you located? I'll try to help you track down a mold with cheap postage. Hi Darcy, try Tony's fragrance oils.I believe they're located in Georgia. Excellent pictorial tutorial. thank you for the simple swirling technique! You're very welcome. :) Happy soaping! This looks much less frightening than a lot of soap makers would have you believe! Thank you! 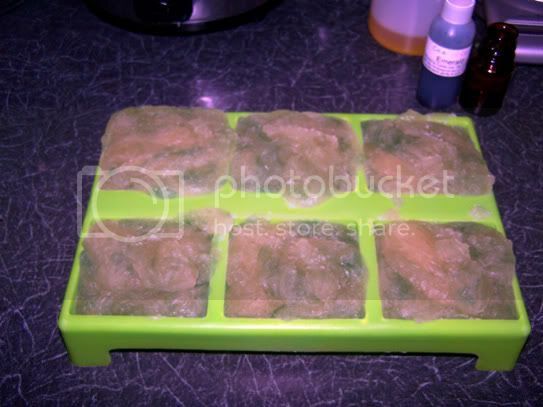 Can I use the same recipes that I use for CP or do HP soap require different lye quantities? Hi Michelle, as long as you're careful with the lye, soap making shouldn't be scary at all. And you can use the exact CP recipes for HP. No problem! I did it woohoo! Not a caustic burn in sight! I put a link to this tutorial on my blog (I hope that's ok) and also to your shop. There are some pics on my blog if you want to see my first attempts! I'm am totally addicted to HP now! But I'm not happy with my mould situation - I fancy one of those long wooden moulds that you slice into bars - can you use these for HP? or do you recommend something else? I'm not mad about the individual moulds if I'm honest. You can use any mould you like! Just be sure it's not made of aluminium. Technically, even this shouldn't be a problem with HP since all of the caustic soda will be gone by the time the soap goes into the mould, but it's probably safer to avoid aluminium, just in case there is any leftover lye. Thanks, Liz! I'm always interested to see how others are experimenting with HP. It's such a fun process! Thanks for the great tutorial of HP! I made a batch of lavender soap in a two-layer stainless pot. It was so easy! I will definetaly make some more soon, and I'm so glad that using HP I still can give my soaps as Christmas presents! Thank you, Taina! Happy soapmaking! Just made my first batch of hot process following your tutorial. 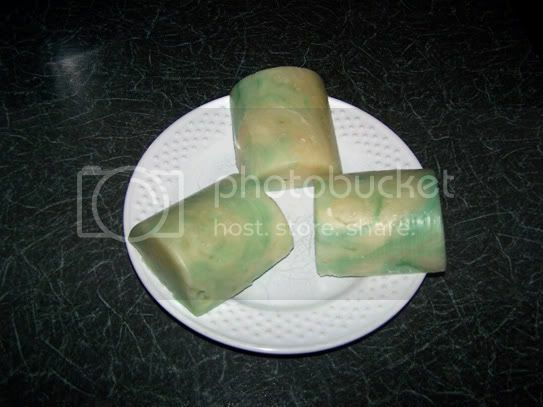 Was prompted to have a go as I need to get some Christmas soap ready in time. A lovely lemongrass, rose and green tea. Great tutorial. Takes all the mystery out of the hot process. I think I'll make all my soap this way now. Hi Paul, Thank you so much for your comment. I'm glad the tutorial helped. Hot process is good fun and dead easy. Thank you gracefruit, what an easy way to hp!i have always been confused with most tutorials but this makes it easier for me to try out even though am going to make mine on stove as it is a bit costly to buy a crock pot here in AFRICA. GREETINGS TO YOU FROM AFRICA. Thanks gracefruit.this is for me,the most understandable way to HP even though am going to be making mine on stove.it is not sooooo easy buying crock pot here in AFRICA.thank you once again and best wishes from africa. Thanks SL! I'm so glad you're enjoying the tutorial. 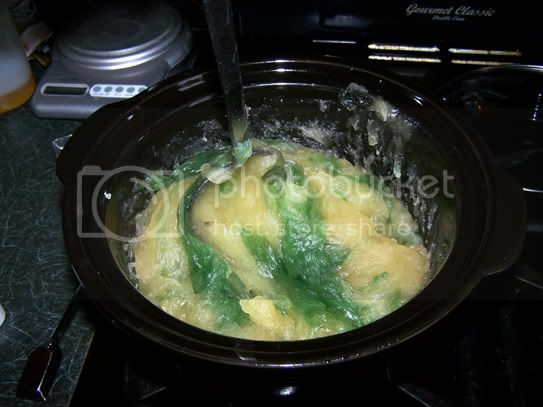 It's very easy to make the same soap in a double-boiler/bain-marie on the stovetop. Hi. I'm a new soaper and I used your tutorial to make HP soap today for the first time. I think it turned out pretty good. I've made CP soap twice and the only reason I used the HP method today is that I needed soap gifts for three nieces in the next two to three weeks. To my surprise, I really liked the HP method. My crock pot is small so I made a 2 lb. batch of Crisco, coconut oil, olive oil, and castor oil, splitting it in half for coloring and fragrancing. I used French powdered clay for color and EOs for fragrance. One soap is Mango-Kiwi and the other I'm calling "Lime in the Coconut." I'm loving this world of creativity and fragrance! yay! I'm going to make soap, thanks to you : ) I plan on checking the local thrift stores for a crock pot today. Where is the best place to find lye? Thanks so much for taking the scary out soap making. GC, where are you located? In the UK, you can find lye at Homebase or B&Q. Is there any way that the hot process could be done in a microwave oven? I have done successful rebatches but never made soap by hot process. Thanks for the tutorial! I made my first batch of soap today and it's cooling in the pans as I type this:-) I didn't want to buy molds, so I used a couple of disposable foil loaf pans. I lined one with oiled parchment paper and oiled the other one but left it unlined. Just thought I'd see if it's ok since I hot processed it. We'll see! For my first batch, I added grapefruit essential oil, orange zest and some tumeric for colour. I can't wait to see how it turns out! Wow! I was afraid to try this, but it was so easy following your instructions. Perfect soap the first time around! I'm going to use this method a lot as it gives me peace of mind to know right away that my soap isn't caustic. Thanks! I have tried to follow the instructions in an open pan, and a slow cooker. I do not get an even colour, but it is flecked with paler patches. 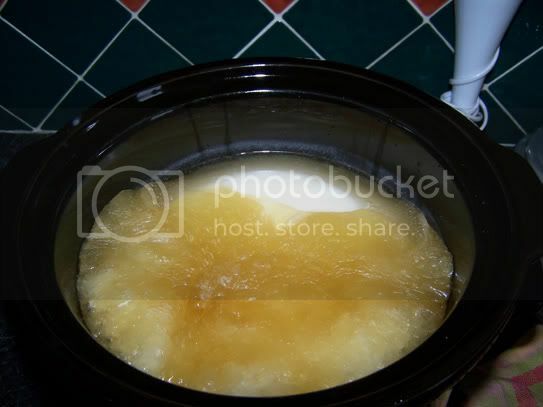 I have tried it with the slow cooker on high and low, and I get the same result. Do you have any suggestions? I just bought a slowcooker today. I have done CP and Oven process and I like both methods (CP for swirlability and OP for quick saponification) so I am really curious to check out the crockpot method. I searched online for Crockpot soap methods and your tutorial was the best and easiest I've come across. Thanks. Also there was someone from Africa that posted that it was difficult to find a crockpot - depending on where exactly in Africa she is - it is relatively cheap and you can find them in most appliance, department or even some grocery stores (Checkers, Shoprite and Pick n Pay)in South Africa for the equivalent of about +/-$35. I bought a 6.5L today for about $30 - I would be happy to pass on the details of where I got it if he/she is interested. Very helpful tutorial! 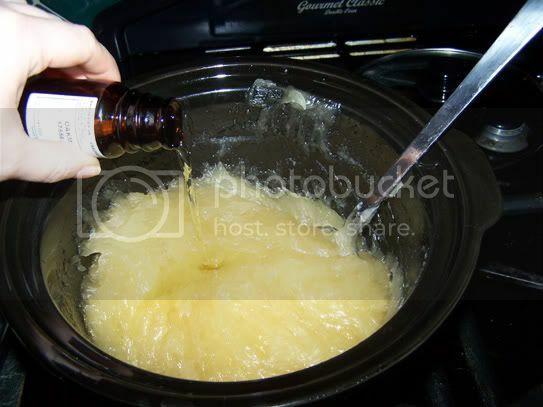 I've never made slow cooker soap before, I was very impressed. I used only tallow and it looks beautiful. Thank you so much for taking the time to make this tutorial so clear. Whoa! You did a great tutorial..
Hey thanks for the awesome tutorial! 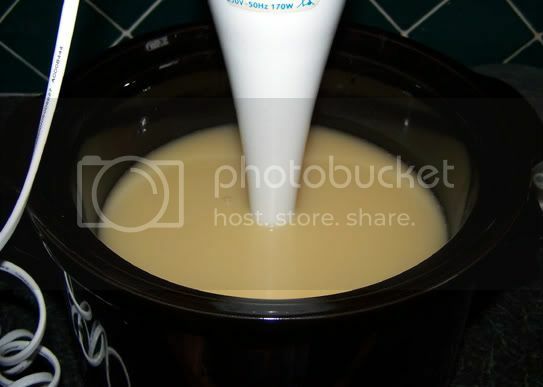 I was wondering if you could do this process and make goat milk soap. I have made soap before, but never goat milk soap and wanted to try a goat milk oatmeal soap - thought I could kill two birds with on stone and try your method too. Is there a list of ingredients for this soap? Quantities of how much of what to put in? I know it's for experienced people and I'm not experienced but I'd love to try it! I made my first batch today using ANOTHER tutorial. When I had no idea how long to cook it and their pictures didn't match what mine looked like, I went searching for another tut and found you. THANK YOU. I made a goat milk - oatmeal - honey soap and it's cooling now and I feel quite certain it will be wonderful. I'll be using your directions in a couple of days when I continue on with batch #2!